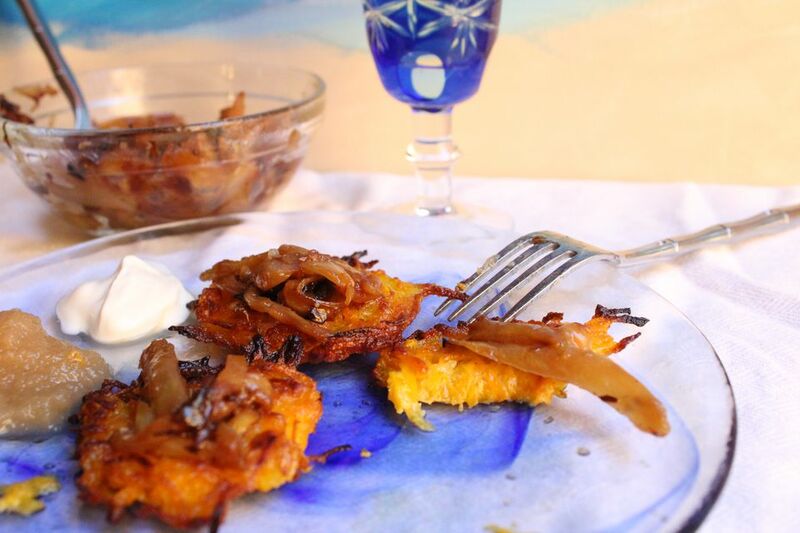 Whether you’re looking for a potato latke alternative for Hanukkah, or want a seasonal fall or winter side, these Butternut Squash Latkes with caramelized fennel jam fit the bill. Unlike potato pancakes, which are best when fried in a skillet, these actually benefit from a stint in the oven instead. Not only are they tastier (they tend to burn or fall apart when skillet fried), they’re also simpler to prepare — and the entire batch is ready to serve at once. Have leftover fennel? Use it as a sandwich condiment! Think cheddar and apple grilled cheese, or grilled chicken and arugula wrap. In a chef’s pan or large, heavy-bottomed skillet set over medium high heat, warm the oil. Add the sliced fennel, stirring and turning occasionally, until the fennel softens and starts to caramelize, about 10 minutes. Add the orange juice, sprinkle with the brown sugar, and continue to cook. Stir frequently, until the sugar melts and the fennel browns, about 3 to 5 minutes more. Remove from the heat and season to taste with the sea salt and black pepper. Transfer to a serving bowl and set aside. Preheat the oven to 425 F. Line two large, rimmed baking sheets. Set aside. Using a box grater or a food processor fitted with a shredding disc, grate the butternut squash and onion. Transfer the shredded vegetables to a large bowl. Use a clean tea towel or paper towels to remove some of the moisture from the shredded vegetables. Add the eggs and mix well. Sprinkle evenly with the flour, salt, and herbs (if using), and mix well. Drizzle 2 tablespoons of olive oil on each of the parchment lined baking sheets. Use a pastry brush or the back of a spoon to spread the oil evenly over the surface of each sheet. Using a 1/4 cup measure or soup spoon, scoop up the batter and drop onto the baking sheets. Flatten the latkes slightly. Slide the baking sheets into the oven and cook for 15 minutes, or until the undersides and edges begin to brown. Remove from the oven, carefully flip the latkes with a spatula, and bake for 10 to 12 minutes more, or until the latkes are cooked through and browned on both sides. Serve hot with the caramelized fennel jam.